The thing about challenges is that they are generally always looked at in a negative light. However, while they present difficulties, they always represent chances to learn something new or perfect an art. Cruise ship chefs jobs are an exercise in perfection, maintaining standards and realising logistical targets. The biggest challenge of cooking on a cruise ship is the volume. Guests on the latest vessels can number in the thousands – the largest, Symphony of the Seas, scheduled to launch in 2018 will carry as many as 5500 passengers. Feeding each of these can be a logistical nightmare for a regular chef. Cruise vacations offer guests an opportunity to taste different food types and indulge in all sorts of treats, so many will eat more than they normally do. Chefs expect that each passenger will eat all three main meals and at least one or two snacks during the day. After all, the guests are on vacation. Limited space is available on a cruise ship, so galleys need to be functional and efficient within that area. Cruise ship chefs jobs entail quick learning in how to manage with such restrictions – passing each other and other kitchen staff in narrow alleyways, keeping cooking and prepping areas clean always – while still getting food out the door on time. Another challenge is the volume of food that needs to be cooked. Even with smaller numbers of about 1300-1500, a cruise ship galley will go through nearly six tonnes of fresh veggies, four tons of meat, 18,000 eggs and 1600 bottles of wine a week. Compared to a land-based job, these numbers are astronomical. On the bottom rung, line cooks might spend a great deal of their time doing just one job – making stock, cleaning vegetables or prepping chicken. The volume also presents another obstacle. Cruise lines do not stop in port every day, so access to fresh supplies is limited. Cruise ship chefs must be able to assess how much stock they will need well in advance. If there’s a mistake and they run low, chefs will need to be able to come up with an acceptable alternative on the go. This situation often crops up with food items like lobster tails or beef medallions, for which requests can vary every day. Cruise ship chefs have the precarious task of ordering enough to last them the week, but also not over-order in which case the food can go bad over time. Storage becomes important. Cruise ship chefs ensure they use items that were stocked on board earlier, so they don’t pass their use-by dates. They constantly make note of their stocks, and must follow stringent rules regarding old food. Due to the volume, stocks like meat and fish are most often frozen. These need to be defrosted correctly, often changing temperature zones over a couple days before being brought to room temperature. This gives you an idea of the type of planning that goes into making a single meal. If a couple has requested a special beef carpaccio for their anniversary on board, planning and defrosting preparations begin a few days in advance. Cruise ship chefs must also contend with limited opportunities to display their own creativity. For those who are not in the upper echelons of hierarchy that decide the menus on board, recipes must be followed to the ‘T’. Cruise line companies prefer to maintain standards on all their vessels. For this, they provide each liner with the recipes as well as images of what the dish should look like. The executive chef will taste every dish under his or her charge every day to ensure that the taste and look matches the company vision. In addition, cruise ship chefs have stringent safety rules to follow and are not allowed the use of gas stoves and open flame barbeques. Everything is electric, and the challenge here is to recreate that taste. Carnival Cruises went to the extent of creating a custom-made smoker that adheres to international sea safety laws for its Pig & Anchor Bar-B-Que by Guy Fieri on the Magic. There are many challenges on board for cruise ship chefs, but that is usually never a reason to say ‘no’ to a guest’s request. This entry was posted in Chef Jobs, Cruise Life, Cruise Ship Jobs, The Galley and tagged Challenges in the galley, cruise chef challenges on October 23, 2017 by admin. If you thought that cruise ship chefs jobs meant slogging it behind closed doors for hours on end with guests having no clue who the creator of their delicious dish is, you’re partly mistaken. Yes, you will be slogging for long hours, but you knew that already. However, cruise ship chefs today are not entirely hidden from the public gaze. Food is a quintessential part of the cruise experience, and today, has become a huge part of the travel industry. In fact, the Food Travel Monitor for 2016 by the World Food Travel Association stated that as much as 93 per cent of travellers can be considered ‘food travellers’, or travellers who participated in a food or beverage experience other than dining out. This means gourmet store visits, cooking schools, food tours, tastings, etc. Cruise ship companies are not too far from cashing in on this exciting statistic. On the high seas, guests focus on the experiences on board, and food comes with a high social media-friendly factor. Think Facebook live feeds, Instagram pictures and Twitter updates. Cruise ship chefs jobs call upon individuals to do more than just cook a meal. They often put on a show. One of the easiest ways cruises do this is to host live cooking demos on board. This involves the chef demonstrating his cooking skills in a particular cuisine style or theme. Cruise ship chefs are required to have an interactive session with guests while doing so, explaining the ingredients being used, asking and answering questions, offering tips on techniques, etc. Guests then get a chance to enjoy the meal that was demonstrated before them. It offers them a chance to learn more about the food they love, and the people behind their meals. In turn, chefs get a chance in the spotlight and an opportunity to share their passion for food. Disney Cruise Line offers complimentary on board cooking demonstrations, showing just how popular these experiences are. 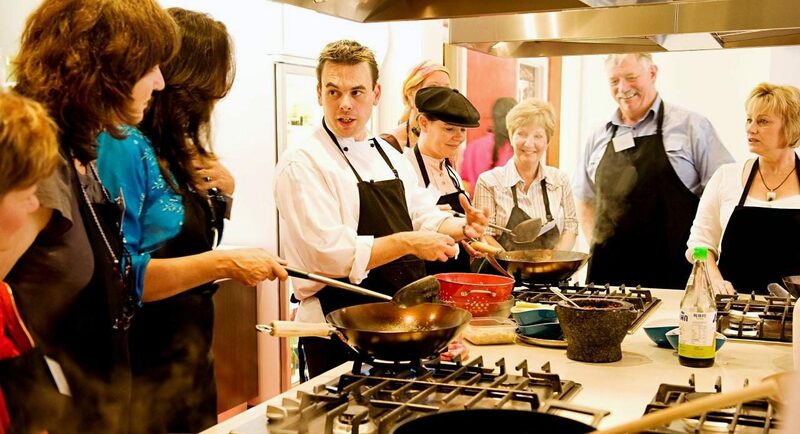 Many other cruise lines have hands-on cooking sessions, where guests who sign up cook alongside the staff. Chefs teach them how to make the perfect salsa or how to cook risotto just right, the ideal way to roll sushi. It often takes place in the galley, or kitchen, and chefs offer one-on-one technique tips before participants enjoy the meal together. Another programme offered by companies that greatly involves cruise ship chefs is the Chef’s Table. This is usually an event with the executive chef who heads the entire food and beverage operation on board. It is often a special, formal affair, priced quite high. Guests get a private tour of the galley with the executive chef with Champagne and hors d’oeuvres, following which they share a meal cooked by him or her with a chance to spend some time with the top chef on board. Cruise ships also offer cooking classes on board. 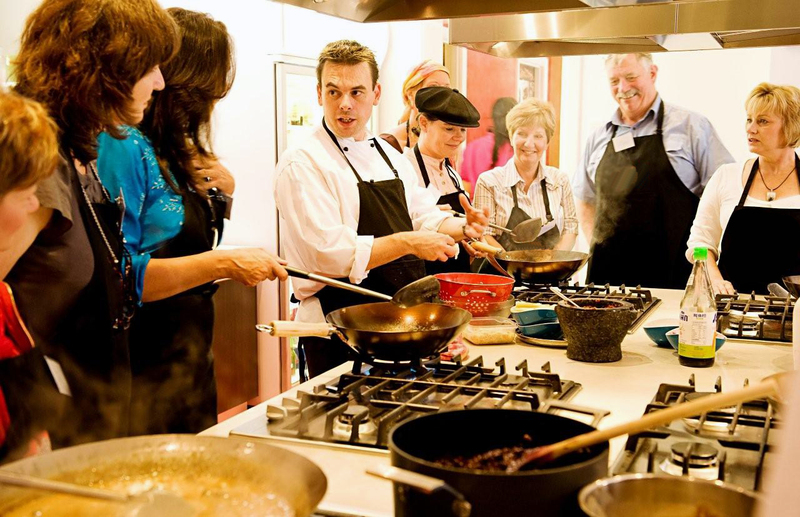 Holland America, for example, has a state-of-the-art Culinary Arts Centre specially created by Food & Wine magazine for its cooking classes. The demonstration theatre features auditorium-style seating and plasma screens so minute observations can be made. Celebrity chefs make guest appearances and cruise ship chefs take over culinary events such as wine or chocolate tastings. Luxe line Silversea holds its L’École des Chefs by Relais and Châteaux cruise, which is an entire voyage dedicated to cooking demonstrations, “lunch and learn” sessions, market tours and classes, knife skills workshops and more. Celebrity Cruises even hosted a Top Chef At Sea competition in 2015 and 2016 in which guests watched the reality TV show contestants battle it out on board, and also got a chance to take private cooking classes or dine with them. Today, cruise ship chefs are more than makers of meals. They are a major part of the reason the industry keeps growing. This entry was posted in Chef Jobs, Cruise Life, Cruise Ship Jobs, The Galley and tagged live cooking on October 7, 2017 by admin.